This was my first book. It’s all about voice systems from an early 1990s perspective and is only of historical interest now. 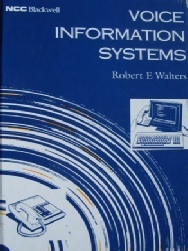 However it is the earliest book to describe CTI (then called Computer Supported Telephony) and is still valued by those fighting patent battles in this arcane area. It’s well out of print but I have a few new copies (with bendy covers, cheap material I suppose) so if you happen to be interested I can supply at £10 a copy plus postage. Contact me via the form below.